Let’s talk about Rome today: one of the best-loved Italian destinations for tourists from all over the world. Ten absolutely-must-see sites in Rome. Everything not to miss in the Eternal City. As I often work in Rome, I get lots of chances to visit it, and its extraordinary beauty never ceases to amaze me. As I stroll through the center of Rome, I often look up and am dazzled by a monument, a church, an obelisk, or a fountain suddenly appearing on the horizon. Rome never fails to thrill me. Ten absolutely-must-see sites in Rome, in a weekend! But what if you only have a weekend to see the city? How do you choose what to see and how to plan your time to see the best Rome has to offer in just two days? Of course, Rome is big, and we have to consider the distances between sites as well. Say you get to Rome on a Friday afternoon. Once you’ve gotten settled in your hotel, the first thing I’d suggest is taking a nice stroll in the center. It’ll already be dark out since it’s winter, and Rome is full of enchanting corners beautifully lit after sundown. What are the evening must-sees for the winter season? Rome’s center is large and rather spread out. So let’s focus on just one area. Let’s start from Piazza Navona. This beguiling Roman square is distinctive for its unusual elliptical shape. The shape comes from the fact that Piazza Navona was built on the racetrack of the old Stadium of Domitian. One of Rome’s most famous squares, Piazza Navona, is definitely one of Rome’s finest baroque square. The square is home to many restaurants and cafes, and hosts grandiose Christmas markets every year, shining with thousands of lights every holiday season. Piazza Navona is best known for its two incredible fountains, the Fountain of the Four Rivers, a peerless Baroque masterpiece by Gian Lorenzo Bernini, a remarkable sculptor and architect, and the Fountain of the Moor sculpted by Giacomo della Porta. Let’s head towards the Pantheon from Piazza Navona. The unique Roman-era edifice makes an immediate impression on visitors with its contrast between the square entrance, a common feature in ancient temples, and its enormous round interior. Its dome is topped by a large opening, from which you can see the stars — it’s one of the great architectural wonders of all time. The Pantheon is open until 7:30 pm and entrance is (still) free. 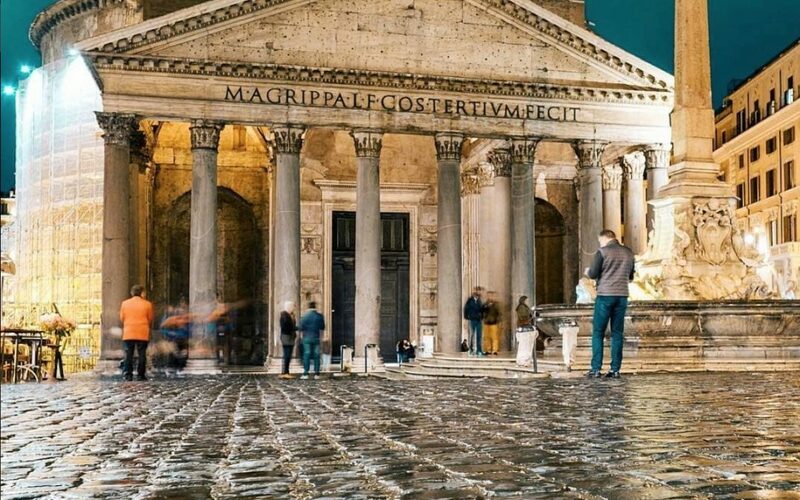 Let’s end our evening stroll with a stop at the must-see Trevi Fountain. No doubt the most visited and famous fountain in Rome, Trevi is also the most dramatic. At night, it is also lit to outstanding effect. Especially if it’s your first time to Rome, you can’t forget to toss a coin in the fountain and make a wish. This brings our evening walk through the Eternal City to an end. Let’s go back to the hotel and get ready for tomorrow! Let’s keep going with our ten absolutely-must-see sites in Rome. We’ll spend all day Saturday amidst the treasures of the Vatican. Among the ten absolutely must-see sites in Rome are the Vatican Museums. Over six million visitors come to these museums yearly. The Vatican Museums are a treasure trove of art unlike any in the world. I suggest taking at least 3 or 4 hours here, renting an audio guide or reserving a guided tour. This will help you appreciate the main artworks, at least, without getting lost in its vastness. Of course, an unforgettable must-see here is the Sistine Chapel, heart of the Vatican Museums and only accessible from the museums. It’s a 15-minute walk from the Vatican Museums to St. Peter’s Square and its majestic Basilica and the giant colonnade that Bernini designed to embrace the whole square. Our day has come to an end but the evening still awaits us. So let’s head to the Trastevere neighborhood to dine in a local restaurant and sample some traditional Roman cuisine. With dozens of bars, restaurants, and cafés, this historical Roman neighborhood brims with life. 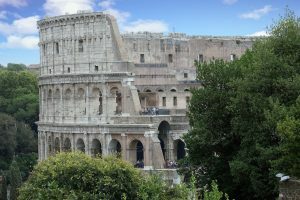 Ten absolutely-must-see sites in Rome, the Colosseum area! The next day, let’s delve back into the past in Rome’s premier archaeological area, one of the most famous anywhere in the world. The Roman Forum where the Coliseum is the undisputed star. It is well worth booking a guided tour that lets you inside the amphitheater and, importantly, the highest tiers of the stands. You can now book a tour of the viewpoint, which lets you go up to the fifth tier, from where you can take in a dazzling view of Rome. But the Roman Forum area has much more than this to offer visitors. The same ticket gets you inside the Roman Forum to see the arches of Titus and Constantine. This part of Rome is overflowing in monuments of different eras making truly astonishing contrasts. As you walk down Via dei Fori Imperial, along the Forum, amazing Roman ruins are to your right and left, and if you look up, you can see the Altare della Patria [Altar of the Fatherland] and the Trajan markets. These markets were a full-fledged shopping center of the ancient world, and though this monumental complex is ofter rather overshadowed by the more famous Colosseum, it is certainly no less impressive. We’re coming to our last bit of time in Rome, just enough for one last stop: Galleria Borghese. 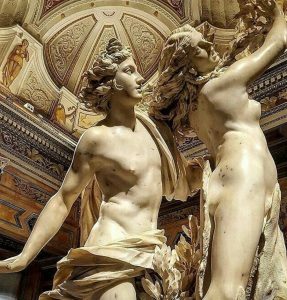 Located in Villa Borghese, the gallery holds some of the finest, most admired masterpieces of artists like Caravaggio, Bernini, Canova, Titian, and many others. That’s it for our ten absolutely-must-see sites in Rome if you only have one weekend. But, needless to say, Rome deserves more than a weekend. In my next post about Rome, I’ll tell you about some places to see if you decide to return to Rome a second time!! !